The bathroom pictures in these galleries feature small images. Please click on them for a bigger and better quality image. The list below links to a selection of case studies featuring bathroom pictures from completed projects. These galleries show installations completed by Richmond bathrooms. We install bathrooms, shower rooms and wet rooms all over south west London. The bathroom pictures you will see are from projects we have designed and installed. There are pictures from projects in Richmond, Teddington, Kingston, Sheen, Twickenham, Barnes, Chiswick, Wimbledon and Putney. We work on projects all over London. Take a look through the case studies and if you have any questions or comments please feel free to let us know. We hope that you will find ideas and inspiration for your own project. You can click here to see our contact details. These bathroom pictures feature a wide variety of different bathroom fittings and tiles and therefore highlight the wide range of skills we offer. These include detailed tiling using all tile types and formats, complicated plumbing solutions and bespoke carpentry. 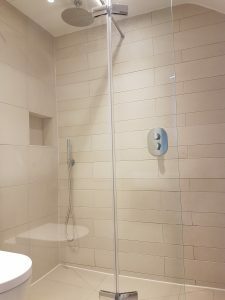 Long experience in the bathroom industry means we are in a unique position to advise you on all aspects of your bathroom project from lighting and ventilation to the best type of paint to use. We will deliver bathroom projects that not only look good but are well planned and designed to stand the test of time. If you would like to view any of the bathrooms you see in our galleries. Our clients are usually happy to allow people to see our project work. Marrazzi tiles and a Merlyn 8 series shower wall feature in this wetroom. An impey aqua dec is used to waterproof and form the floor. The shower valve is from Cifial.